Unemployment is a global issue which happens in developed, under developed and developing countries. The major evidence is that even the developed countries are battling with unemployment issues. A survey has suggested that in 2013 December, about 6.7% of Americans were unemployed. The international labor organization has mentioned the statistics of both employed and unemployed in 2012 which states that about 6% of the world population are unemployed and youths are the ones who are unemployed i.e youth unemployment. The government and individuals should take proper remedy steps to solve unemployment problem and develop the nation’s economy through employment. Unemployment can be defined as when an individual is hunting for employment and does not find a job, then unemployment arises. Unemployment is one of the major crisis that happens around. The term unemployment measures the economy’s health. The unemployment rate is usually used for measuring unemployment. It is usually the unemployed individuals divided by a number of labor force people. The reports as per the international labor organization said that about 200 million globally or about 6% of the complete workforce was unemployed in 2012. In that manner let’s glimpse through a few aspects of unemployment and the various aspects related to it. The unemployment rate reached a post during World War II to a high of 9.7% in 1982. The data regarding unemployment and earnings was captured by the Department of Labor’s Bureau of Labor Statistics (BLS). There were other reports too which mentioned unemployment rate of 9.6% in the year 1983 which was due to an economic recession. This was after the great depression of 1983. It was in 1989 that the unemployment rate dropped to 5% but started enhancing again. This led to 6.8% in 1991 and to 7.5% in 1992. Once there was an enhancement in an economy, the unemployment rate fell to 6.9% in 1993. The good news was that the unemployment rate fell to about 4.5% in 1998 and to 4% in 2000 which was considered as the lowest in three decades. It was in 2001 that recession crept in and unemployment rates rose again and then the terrorist attack on September 11, 2001, in the United States was also a reason of unemployment. By 2003 June, about 9.4 million was unemployed where the unemployment rate was elevated to 6%. There was again a decline in the unemployment rate from 2003 to 2007. The fluctuation started again and there was a rise in the year 2007 and the unemployment rate was 4.9% in 2008 January. People without a job and looking for work are counted as unemployed. It does not include people who have lost their jobs and not looking for it. At times when there is a mismatch of skills in work industry this unemployment occurs. Some of them are partitioned as mentioned below. Geographical immobility type of unemployment happens due to the difficulty the individual faces in shifting to other regions for a job. For example, jobs may be available in California but it might be tough to get accommodated or find appropriate schooling for children. Occupational immobility kind of unemployment occurs when a candidate is unable to learn new skills which need to be applied in the new industry along with a change in technology. A simple example can be that a farmer unable to work in high technological industries. There are many industries which possess the labor-saving technology and have led to falling in labor. This has been the main reason for unemployment after the technology has advanced. Structural change that happens in a nation is another reason for this unemployment. For example, the weakening of coal mines because of the absence of competitiveness has made a number of coal mine workers unemployed. These people cannot find jobs in any new industries which include computers and technology. This type of frictional unemployment prevails in many countries. This type of unemployment is the period which is taken by the individuals while they change their job. Examples are graduates who try to find another job. It surely takes time in order to find another job. This type of unemployment takes place when the wages in the competitive job market moves above equilibrium. For example, when the supply of labor is higher than the demanded labor, this type of unemployment takes place. Times when trade unions and labor organization bargain for higher wages are when this type of unemployment occurs. This leads to a decline in demand for labor. Voluntary kind of unemployment is one where people try to be unemployed than being employed. A simple example can be that if individuals are able to get a good benefit, then they prefer to stay back with the benefit rather than being employed. Frictional unemployment also falls under this category where individuals tend to choose a job until they wanted an appropriate one. The demand deficient or cyclical unemployment takes place when economy falls below its full capacity. A simple example can be the aggregate demand which falls below at times of recession which leads to weakening in negative economy growth and output. When there is a drop in the output then the employment of workers will also be less which leads to the development of fewer goods. There are many firms which move out of the business and result in redundancies in large-scale. There are more of workers being lay off during recessions which lead to unemployment. This is one category of unemployment which takes place due to seasonal change in the job nature. Few industries that are affected by seasonal unemployment are catering industries, fruit picking, tourism, and hospitality. Youth unemployment is another major concern that is happening. 73 million people are globally neither unemployed nor undertaking education. Youth unemployment is three times ahead of the elders. In the US, the youth unemployment rate is about 5.7% and about 17% of the nation’s youth are jobless. Casual employments is the type of employment that comes in, for employees who work on a day to day basis or on short term contracts. When the contract is completed, the employee will get unemployed and that type is known as casual unemployment. This type of unemployment would not stand for long, as the workers get another contract work or the earlier work gets extended. Most of the places where casual employment exists for people are dockyards, market places, film industry (junior artists) etc. Here the work of the workers gets completed or lasts for just few hours or day long and then they get back to the same unemployment position. This process goes on till they find a permanent job. It is very difficult to provide a definite solution to such casual unemployment issue. Unemployment effects in nations leads to a number of hassles, in that manner let’s glimpse through a few effects of unemployment. Due to unemployment, there are fewer people who work and earn money and hence only less income tax would be collected. There would be a less tax revenue collected by the government and would have a large impact on government finances. Due to unemployment, there would be a number of people who do not work. The government needs to teach the employees with skills which are required for the present industry conditions. So it is the duty of the government to spend by training skills so that they match with the latest industry. This is a drain on the government’s economy due to unemployment. During unemployment period, few people would work but almost all people would claim for benefits. Due to this, the government money is drained again. The government finance is used for providing benefits for the people. At times of unemployment, there is increased the supply of labor for employment in firms. In this scenario, there is a decline in wages as there is a number of people ready to work for lower wages. By this way, the industries have a positive effect and their variable cost would decline. Due to impact of unemployment, there are a number of candidates ready to work and hence, the industries have enhanced choice for employment. They choose skilled labors with more experience. Few goods in an economy are purchased more at times of lower income for individuals and these are mentioned as inferior goods. During unemployment period, people switch over to purchase more of inferior goods due to low income. Inferior goods owner would have a higher profit and sales revenue. Unemployment makes individuals avoid buying goods and services as they possess a very low income. In such scenarios, there is lower sales revenue that leads to a decline in profits. Though there are many firms that benefit themselves from low wage cost as a result of unemployment, they also need to spend and train employees as they have been out of work for a long period. Training employees are accomplished with the firm’s resources and time hence, there is an increase in the employees cost. Private savings and benefits are the only sources which people rely on at times of unemployment. They do not spend much and buy only a fewer goods for their living and hence, they are pushed to a lower standard of living. Unemployment is a period where people are pushed to depression and loss of confidence. Almost all people who are unemployed are lead to stress-related depression and also ill most of the time. Skills and capability to work are lost by individuals during unemployment period. The prolonged period a person is unemployed, the more the industries have to train them in order to make them work. Unemployment can be solved if planned properly by the nation from the start. There are a number of ways by which natural rate of unemployment can be solved. • Being positive to stop unemployment. With all this, there should be few policies implemented that improve economic growth. The expansive monetary policy is one main solution which can help avoid unemployment. There should be expansive monetary policy from Federal Reserve since it’s quick, effective, and powerful. When there are lower interest rates as mentioned above, they allow individuals to borrow in a cheap manner to purchase a car, consumer goods, and more. By this way, the interest rates allow business to borrow money at lower rates which also offers them with capital to hire employees in order to meet rising demands. These are few aspects that need to be followed in cooperation with the people and government in order to solve unemployment. National Unemployment rate can be decreased from the nation when planned and implemented in the right manner. Natural unemployment is a major concern in any country and hence focusing on it is important in order to save the nation from economic decline. As unemployment affects every individual in the nation, there needs to be proper economic conditions and maintenance by the government. The government should be prepared in order to take the right steps at times of recession which leads to unemployment. 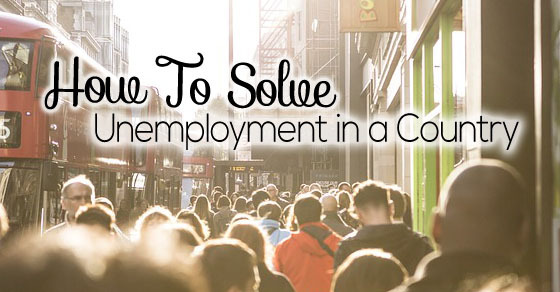 The unemployment solutions to the unemployment problem are also mentioned and hence unemployment is an aspect to be concentrated by all citizens of the country. Unemployment is a major crisis and may bury the economic condition of the complete nation and hence be following the right procedure is mandatory. People who are unaware of unemployment and not sure about the inner details can run through these points and get benefited. Work towards developing a nation free from unemployment.